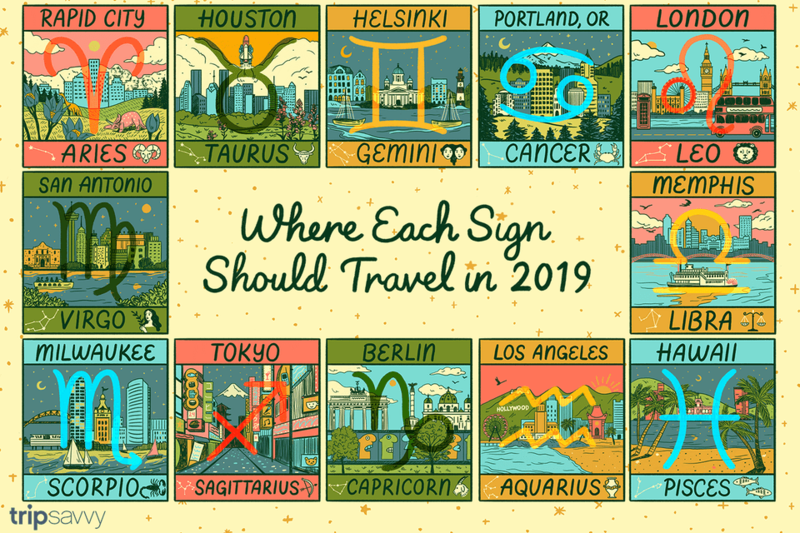 Consult your zodiac sign to discover your best vacation destination in 2019. There are many ways to pick your next vacation spot: You could throw a dart at a map, repeat visits to your favorite place — or find a destination where the stars will align! Believe it or not, every astrological sign has its own personality — just like every vacation. Use your zodiac sign to inspire you and pick the most compatible place for you. Whether you're a restless Sagittarius or an exhausted Pisces, we’ve found your next getaway. Aries (March 21 – April 19): Rapid City, S.D. Aries tend to get bored easily and are always looking for new adventures.They don’t view vacation as a time to relax but more as an opportunity to explore. Our pick for these restless adventurers? Rapid City, South Dakota. Get outdoors and burn that extra energy in nearby Black Hills National Forest and Badlands National Park. In town, spend time shopping or paying respect to our founding fathers — the town has life-sized statues of nearly every American president, with Barack Obama’s likeness making its debut in 2019. Taurus is known to love luxury, and vacation is the ultimate time for a treat. One of their favorite ways to indulge is through food (no one owns the term "foodie” quite like a Taurus). As the most diverse city in the U.S., Houston is the perfect spot to provide this snack-happy sign with endless options for their indulgent palates — we’re talking decadent Tex-Mex, Viet-Cajun fusion, and classic chicken-and-waffles. Geminis are adaptable to any situation: they can transition from social butterfly to introspective introvert easily. That means they need a destination that keeps them on their toes. Helsinki is a city that will not disappoint. With multiple new art museums and stand out architectural landmarks, this cultural city will keep that fast paced Gemini mind occupied. Cancer (June 21 - July 22): Portland, Ore.
Cancers’ most notable trait is the tendency to nest and nurture. They’ll fill their homes with plants to make them as cozy as possible for themselves and their guests — so Portland is a natural pick. The City of Roses has extensive green spaces that will make Cancers feel right at home. Explore sprawling forests, admire the Japanese Gardens, or spend time simply soaking up the cozy atmosphere. Leos love to be seen. They want to be the life of the party wherever they go, and London is the perfect place for Leos to experience the fomo-inducing nightlife they crave. Leos will have the opportunity to impress the public at one of the many gin distilleries or rub elbows with high-profile clientele at some of the landmark cocktail bars — think celeb hotspots like Claridge’s, up-and-coming breweries like Redchurch, and members-only clubs like Annabel’s (if you’re lucky enough to get in). London is the place Leos will finally find a party-loving crowd that can keep up. Virgos love to learn, and the history rich city of San Antonio offers ample opportunities to enrich your mind. Sure, the Alamo is famous, but it’s just one of five Spanish Missions in the region. The buildings date back to the 1700s and were recently named UNESCO World Heritage Sites. Virgos will leave this educational destination with more than a few facts to win at their next game night. Libra (September 23 - October 22): Memphis, Tenn.
Libras love two things: balance and style, and Memphis offers both in spades.The city is quickly rising as a travel hotspot, thanks in part to its lively music scene, infamous nightlife, and remarkable bbq. There’s a little bit of everything in Memphis that will keep Libra’s scales in-line. Even better? Libras love to be on the forefront of trends, and they’ll love being able to say they came here first. Scorpio (October 23 - November 21): Milwaukee, Wis.
Scorpios ultimately want to break away from the hustle and bustle of everyday life and not compete with the raucous crowds in insta-famous cities. This low-key destination will easily win over their hearts. With great cheese, craft brews, Midwest charm, and weather that practically demands cozying up with their sweetheart, what else could a Scorpio want? Sagittarius can’t stay in one place for too long. They’re always down for a trip and will do almost anything just for the story — and Tokyo offers plenty of stories. The city has long been on most traveler’s must-see lists, but in 2019 the city has a renewed focus on becoming tourist-friendly. 2019 should be the year Sagittarius finally checks this location off their bucket list. Capricorns are extremely practical and disciplined, which means they are often hesitant to splurge on a big getaway. While Europe isn’t typically considered a budget friendly option, Berlin has a number of free and low cost attractions that will allow Capricorn to indulge without feeling guilty. Berlin is also packed with history and cultural touchstones that will scratch Caps’ need to feel like they are accomplishing something while away. Aquarius travelers often have unique interests and love to dive deep into topics they care about. While L.A. is best known for Hollywood it also has a surprising number of museums and attractions that will appeal to science nerds and film geeks alike. The city helps all Aquarius find their flocks, no matter how quirky their tastes might be! Pisces travelers are dreamers with their heads forever in the clouds. As the sign of the fish, there truly is no better place for a Pisces than the beach. This water sign will relish the chance to relax on beautiful Hawaiian beaches and they’ll feel fully recharged after taking in beautiful scenery and daydreaming to their heart's content.